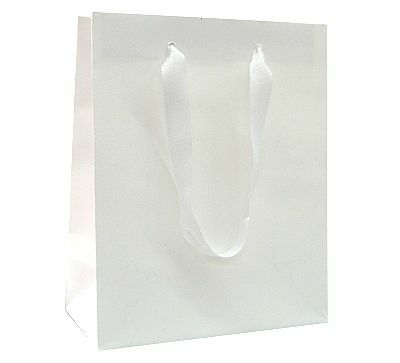 White paper gift bags are made from white kraft paper, with twisted handle,flat paper handle,or rope handle,coming in many sizes to fit any occasion.As eco friendly shopping bags,white paper gift bags look more elegant.they are the cost effective and green way to wrap gift items and products.Paper Bags Shop wholesale wide range of white paper gift bags,white kraft gift bags at cheap wholesale pricing. 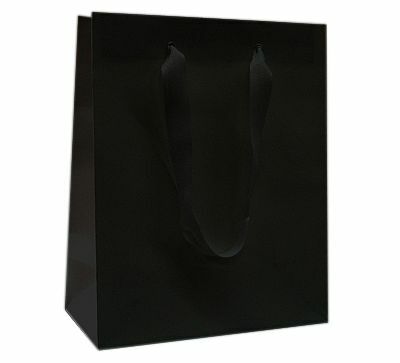 custom logo can imprint on bags. 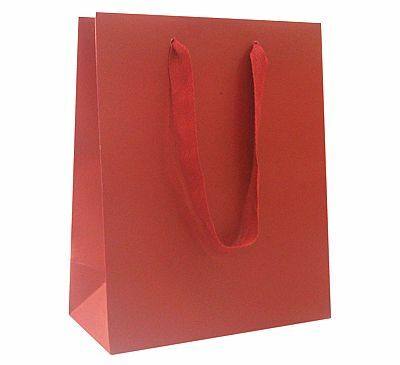 1) 5-1/2 x 3-1/2 x 8-1/2"
2) 8 x 4 x 8"
3) 8 x 4-3/4 x 10-1/2"
These white gift bags are made from recycled white kraft paper,with twisted paper handle,100% recyclable and bio-degradable,Paper Bags Shop wholesale recycled kraft bags coming in 14 sizes,custom logo can be printed on bags by hot stamping. 1）5-1/2 x 3-1/2 x 8-1/4" 2) 5-1/2 x 3-1/4 x 12-1/2"
2) 8 x 4 x 8" 4) 8 x 4-3/4 x 10-1/2"
5) 10 x 5 x 10" 6) 10 x 5 x 13-1/2"
7) 13 x 7 x 12-1/2" 8) 13 x 7 x 17-1/2"
9) 13 x 6 x 15-3/4" 10) 14 x 9-1/2 x 16-1/2"
11) 16 x 6 x 13" 12) 16 x 6 x 16"
Size 1) 4-1/2 x 4-1/2 x 15" 2) 5 x 4 x 6"
3) 8x4x10" 4) 10 x 5 x 13" 5) 16 x 6 x 12"
These colorful and beautiful white paper gift bags are made from 100g recyclable white kraft paper,with twisted paper handle.With creative design printing,these white paper gift bags come in 12 designs and 9 sizes.Custom logo can be printed on white paper gift bags by hot stamping--stamping foil are available in many colors--to build personalized shopping bags. 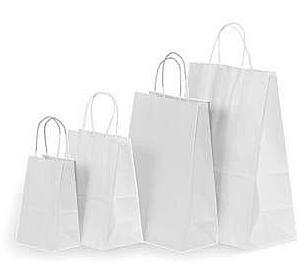 size 1) 5-1/2 x 3-1/2 x 8-1/4"
2) 5-1/2 x 3-1/2 x 12-3/4"
3) 8-1/2 x 4 x 8-1/2"
4) 8-1/2 x 4-3/4 x 10-1/2"
5) 10-1/2 x 5 x 12-3/4"
6) 13-1/2 x 5-1/2 x 15-1/2"
7) 16 x 6 x 12"
8) 16 x 6 x 19"
White paper gift bags at Paper Bags Shop are made from recyclable white kraft paper to build environment friendly shopping bags.Those white paper gift bags come in a wide variety of size,color and design to fit any occasion. 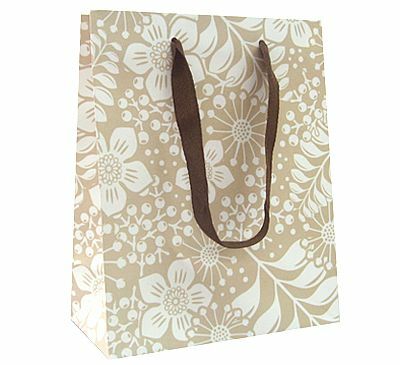 With twisted paper bags and made from 100g recycled white kraft paper,recycled white kraft paper gift bags come in many popular sizes, and the advantage of those recycled white paper gift bags is that they are very cheap,and 100% bio-degradable,Custom logo can be imprinted on bags by hot stamping or silk screen printing to create personalized eco friendly shopping bags that can help you to get most cost effective personalized shopping bags and state more message for your care about our environment. 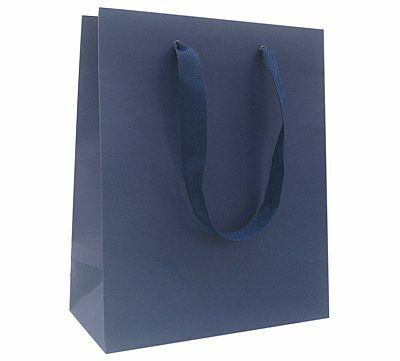 With twill ribbon handle and made from 120g recyclable white kraft paper,reinforced paper board at top and bottom,these luxury white paper gift bags look more elegant and luxurious.With some popular sizes,you can find right size luxury paper gift bags to fit your products and gift item in green way,in the same time,those white kraft paper bags with twill ribbon handle are cheapest luxury paper gift bags.Custom logo can be printed on bags by hot stamping to get personalized paper shopping bags.It is the best way to get personalized luxury paper bags if you just need hundred of bags(in this quantity it is too expensive to build custom luxury paper bags),contact with us to get free quotation.